Amazingly, Thursday’s close marked a 50-day low in the S&P. It was just last week that the S&P closed at a 50-day high. 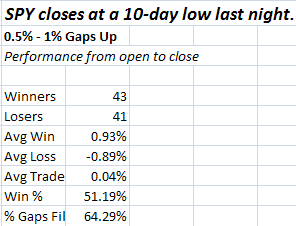 Moving from a 50-day closing high to a 50-day closing low so quickly is quite rare. I only found 6 other instances. Unfortunately, while it appears rare, it doesn’t appear predictive. Below is the stats table. Examining the individual charts left me with no deeper insights. I’ve listed the dates of each instance in case anyone else would like to have a closer look. I’ve shown numerous studies over the last couple of years that illustrate weak bounces from oversold conditions are often followed by downside. 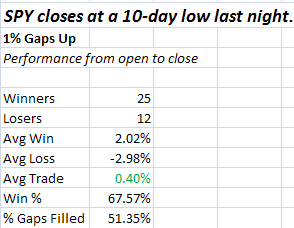 Notable about the above study is that 4 of the last 5 instances showed positive returns 5 days out. The one instance that never closed below the entry was the last instance on 11/2/09. Still, the stats are convincing enough that I’m not inclined to completely ignore them. Decidedly bullish edge here. The average loss size suggests risks are high, though. Buy what if the market pulls back and the gap up is only between 0.5% and 1%? Now you’re looking at basically a coinflip. The evidence I most often show when illustrating a study is a statistics table like the one below. But it’s not all I look at and it never tells the whole story. In the subscriber letter I’ll often go into more detail on some of the studies. Tonight I thought I’d show an example of one study whose stats table I consider to be a poor representation of the truth. Tuesday’s rally was the biggest % gain in at least 10 days. It followed Friday’s selloff which was the biggest % drop in at least 10 days. With the market trading above the 200ma and a new 10-day high being made on Tuesday, it made for an unusual setup. 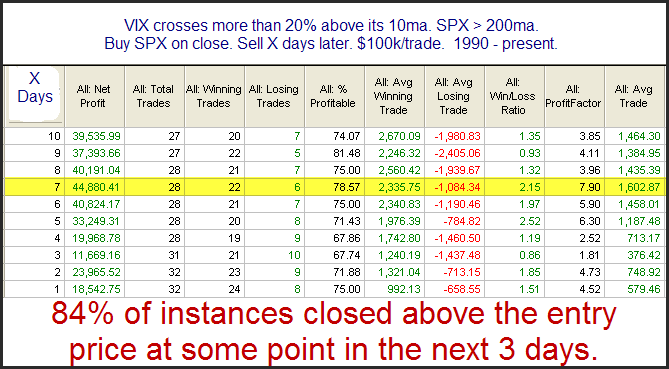 Below is a stats table showing similar setups in the past. From the stats table it appears there is a fairly strong inclination for more upside over the next several days. Now let’s zoom in a bit on some of the results. 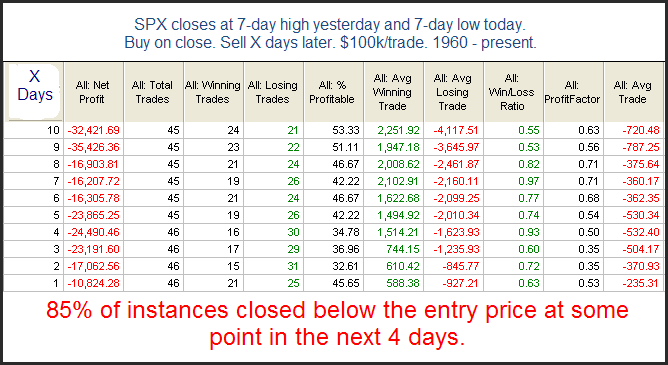 I chose to zoom in on the 6-day here exit since that had the highest win %. Below is an equity curve with the 6-day exit strategy. While the surface stats looked good, this chart tells a much different story. For one, there haven’t been any instances in nearly 10 years. Also, the 10 years prior to that there were only 5 instances and the return from them was breakeven. In other words, it’s been over 20 years since any edge has been exhibited by this study. In fact, just about the entire “edge” appears to be thanks to the 80’s. So while the initial results looked substantially bullish, this is definitely not a study that I would want to base a trade on. Traders who conduct their own studies should keep this lesson in mind. It's important to carefully examine all results and not jump to conclusions based of the first set of numbers. We see here that since the middle of August, 11 of the 12 times the market has gone up 2 days in a row it has managed to follow through with more gains the next day. It’s also shown a profit 2 days later on 11 of 12 occasions. Shorting 2-day upmoves has been an exceptionally poor strategy in this environment. There are at least a couple of ways traders could use this information. 1) They could look for strategies that try and take advantage of this kind of momentum. 2)They could also simply monitor the action of “2 Up Days” going forward to try and get a feel for when momentum may be waning and the environment changing. If you’d like to see more on my recent short-term momentum study, you may take a free trial of the Quantifiable Edges Subscriber Letter by clicking here (email address required). Over the holidays it was easy to ignore the low volume and dismiss it as typical holiday traffic. Traders may have now returned but trading volume is still lacking. The low volume isn’t blatantly obvious because it’s still higher than it was during the holidays. Still, it’s definitely going in the wrong direction here. 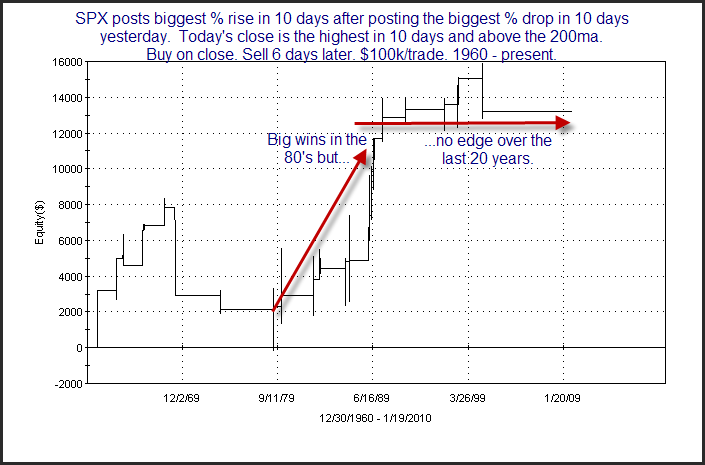 Below is a study I looked at last night using SPY. 1) The net expectations from the active studies published in the Subscriber Letter and on the blog over the next few days. 2) The performance of the S&P versus expectations over the prior few days. The Aggregator System produces mechanical signals based on the values supplied by the Quantifiable Edges Aggregator. Its signals are based on the S&P 500 cash index and all trades are assumed to take place at the close. While it can sometimes be difficult to anticipate whether that night’s research will suggest a bullish or bearish tilt and whether it will be enough to shift net expectations, I have been able to incorporate the Intraday Quantifinder into the process to get a fairly accurate read on what the Aggregator is likely to signal that night. “Probable” signals are published on the Quantifiable Edges systems page about 10-15 minutes before the bell each day. I’ve been publishing them for nearly 4 months now and to this point I believe there has only been one instance where the “probable” signal was switched based on that night’s research. Once the “probable” signal is posted each day I typically send out notification and a link via Twitter to alert subscribers. When I first discussed the Aggregator System on the blog in October it was trying to fight out of an 8% drawdown. It did manage to do so and it finished 2009 at a new high. The total reinvested (hypothetical – not including commissions/dividends/interest on cash) return for 2009 was 36.27%. The Quantifiable Edges Subscriber Letter began publishing on 2/25/2008 so that is as far back as Aggregator values go. Total returns for the partial (10+ months) year of 2008 was 60.20%. Therefore the total compounded profits since inception have been 118.31%. A detailed research paper on using the Aggregator System is available on the Quantifiable Edges Systems page in the members’ area. You may also download the complete performance spreadsheet there showing many different statistics and details of all individual trades. All this information may be accessed with a free trial. I’ve placed a graphic on the right hand side of the blog showing the Aggregator System (hypothetical) equity curve. I will continue to update the performance periodically. So what does a subscription to the Aggregator System cost? It’s included with all gold memberships. If you’ve never trialed Quantifiable Edges, you may sign up to do so here. If you have trialed it in the past, but would like another peak before subscribing, just send an email request to support @ quantifiableedges.com (no spaces). Back in July I did a study that looked at the upward bias of the 1st day of each month. 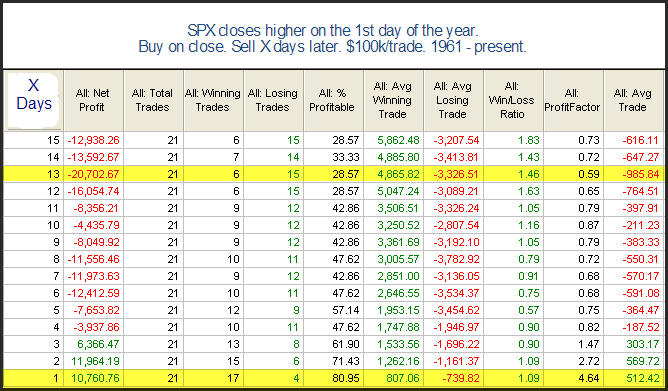 As you may recall I ran the study back to 1987 because prior to that there was no significant bias on the 1st day of the month. 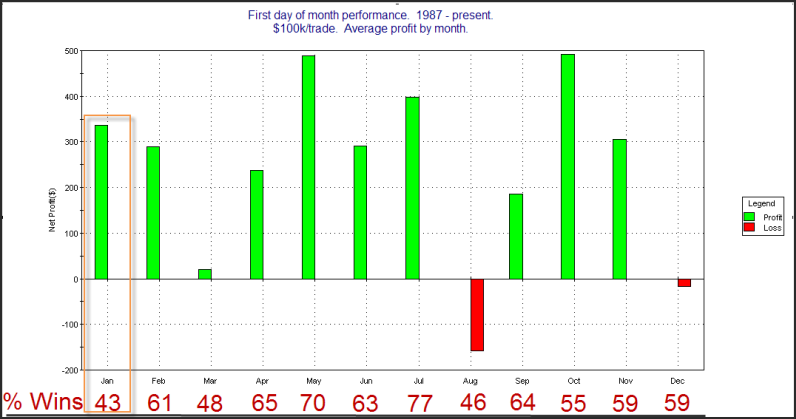 January is interesting because over the last 23 years its had the worst % profitable of any month but still the 4th highest average returns. When New Years optimism runs high it can create a sharp up move. In fact there have been 3 years (1988, 2002, 2009) since 1987 where the S&P 500 has gained over 3% on the 1st day in January. Below is a copy of the table from the July 1, 2009 blog post with breakdowns by month (stats not updated).